Everything is happening now as I had planned. 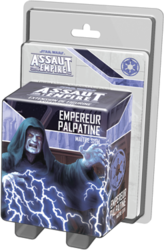 Introduce the ultimate evil in your Assault on the Empire with Emperor Palpatine, Master Sith. The "Emperor's Menus" Project card series provides the Imperial player with new options that will fit into any campaign. This expansion also contains new Command Cards and a single Skirmish mission to play one on one.